I’m in love. My heart has well and truly been struck by Cupid! If you’ve been following me on Twitter and Instagram (if not, why not!? 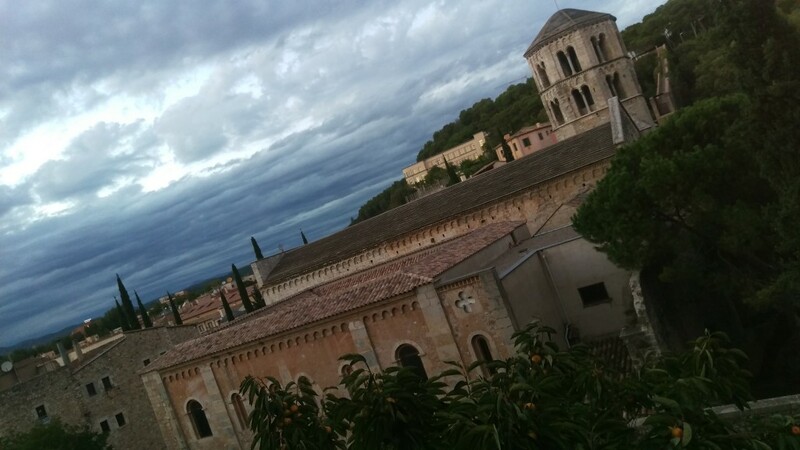 ), it will come as no surprise that the new love in my life is Girona. It stole my heart from the moment my recent Catalunya Experience with the Catalan Tourist Board began and we stepped foot inside the city walls. Until this trip, the only place I’d visited in Catalunya was Salou in 1990 something-or-other on a girls’ holiday, the adventures of which, are best left undisclosed (it was a rather messy affair unsurprisingly). I’d heard about Girona – it’s fairly synonymous with cycling – but I’d never visited until now and, well, it has captured my heart. And for all the Game of Thrones fans amongst you, it seems I’m not the only one to fall under its spell. The film crew had just left the city a few days before we arrived. It’s no wonder they chose it as a location with its intimate atmosphere, wonderful sophistication and historic elegance. Girona reminded me of Venice without the canals. It is filled with narrow alley ways, cobblestones, the most beautiful architecture and stunning views. It’s not full of overtly out there tourist shops or cruise ships. It screams sophistication but in a very eloquent way. Girona evoked a sense of calm in me almost immediately and as the sun went down over the city walls I was a very content and happy person. You can’t fail to be anything but impressed by the Gothic architecture of the city’s Cathedral; it holds such prowess. Girona’s magical atmosphere is tangible. 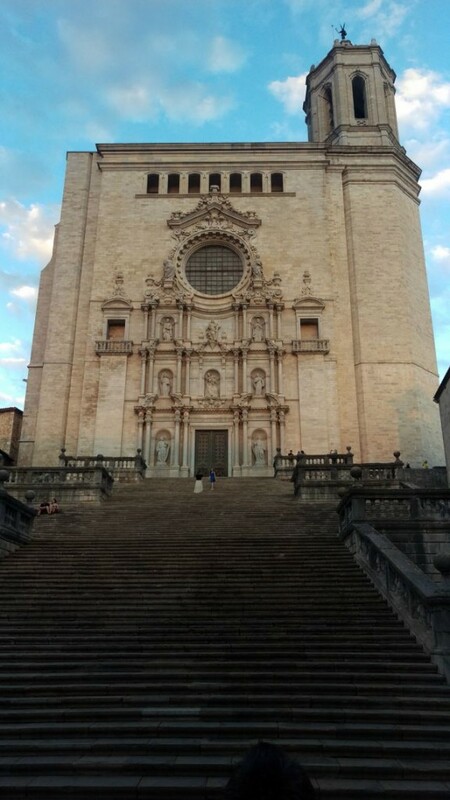 The Collegiate Church of Sait Feliu is also capturing and adds to Girona’s fairytale magic. I was going to say it’s worth checking them both out, which of course it is, but to be honest, you won’t miss them, they’re so imposing! If shopping is you’re thing, you won’t be disappointed! There are plenty of designer labels in Girona, lots of independent shops tucked away and some fabulous eateries. There is the best little gelateria, Rocambolesc! Check out its website. It is ice cream heaven in a little place all set up like Willy Wonka’s Chocolate Factory! It’s owned by the Roca family who also own the world’s number one restaurant. Don’t say I don’t give you great little tips! Here’s me giving away all my best secrets! I’d love to recommend accommodation, but I didn’t really sleep a wink in the hotel we stayed in. It was a lovely hotel, but just out the back of it and right outside my third floor window was a pub or a night club…either way, it was noisy and Thursdays, as I now know, are student night, so I was still awake at 4.30am listening to everyone having a great time. If late nights fuelled by alcohol are your’re thing, I’m guessing Girona can be pretty good for this too! I was excited for the Girona cycling. Not only is Girona itself pretty special, the cycling around Girona is too! And I know that’s what you’ve been waiting to hear about! Girona is pretty perfect for road cycling and with all the pros that come to the city to train why wouldn’t you want to too? There are plenty of local companies offering cycle hire and a whole variety of tours. If you’re cycling around Girona, you need to know that the city has one of the most highly acclaimed cycling cafes, La Fabrica – sadly we didn’t get chance to visit, but next time, I’m definitely there! So, like I say, if road cycling’s your thing, there is plenty going on in and around Girona. They’ll take you on guided tours or provide you with self-guided routes depending on your preference. Instead though, we transferred to the local town of Llagostera, a 30 minute drive away and from there, cycled to the beach at Sant Feliu de Guixols on the Costa Brava using the Pirinexus route and the Green Ways of Girona! The Pirinexus is the largest circular cycling route in the south of Europe. It crosses the centre of Catalunya and the French Pyrenees along the Costa Brava coast. 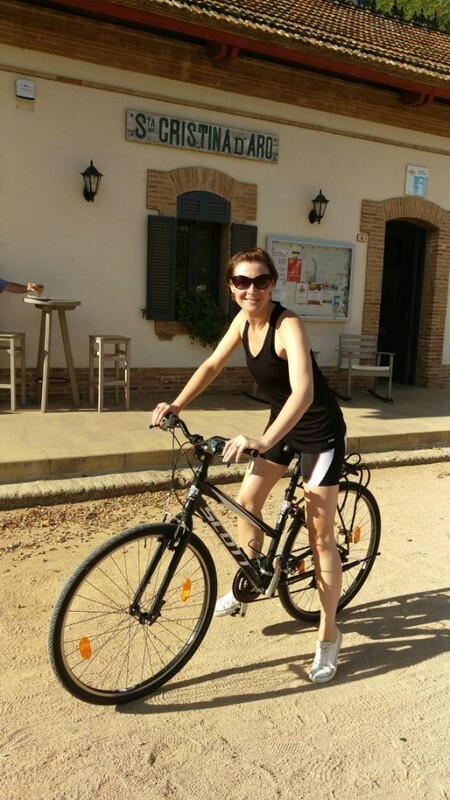 From Llagostera to Sant Feliu de Guixols is a 20 km cycle route – if you want to skip the 30 minute car journey you can cycle the whole way, which is around 40 km – next time I’m cycling around Girona I will definitely be doing this. My Catalunya experience was five days long altogether, each day was spent exploring somewhere new. Cycling from Llagostera to meet the EuroVelo 8 at Saint Feliu de Guixols was the perfect way to end 24 hours in Girona! The only thing I can imagine making it better was if we had cycled the route in moonlight, just as our leader, Miquel reminisced to me. We rode Scott hybrid bikes and cycled along the Vies Verdes, an old disused railway track, until we reached the harbour of Sant Feliu de Guixols. Despite a few tiny hills, the route is mostly flat – even if you do the whole 40 km from Girona. It is a fabulous way to explore. The sun in September was a very lovely 26 degrees with a gentle breeze – just perfect! And the security of the flat track allows you to concentrate on the scenery, the woodland, the aromas and to really enjoy the warmth of the Costa Brava sun. And what could be better than arriving at the pretty harbour of Sant Feliu de Guixols? It provides the perfect opportunity for a laze on the beach, a swim in the sea and a few minutes of simple relaxation watching the boats in the harbour. Lunch by the beach – tapas, seafood and a cold glass of beer – rounded it all off for me very nicely indeed. Bliss! I so want to go back! I want to revisit Girona, revisit Sant Feliu de Guixols, explore more and do lots more cycling around Girona. It’s mainly flat so perfect for all the family and all abilities – and it ends at the beach! The Vies Verde is best suited to hybrid or mountain bikes – so not one for your road bike but there is definitely road cycling on the door step. If you want to fly direct to Girona, Ryan Air have flights in the summer period, from May-October. Alternatively, you can fly to Barcelona and then transfer to Girona by rail with RENFE which takes 90 minutes. There’s also a high speed train from Barcelona which will get you to Girona in under forty minutes. Rails costs are very reasonable; a return ticket on the high speed train costs approx 26 Euros and on the slower trains, approx 23 Euros. Not bad at all! And perfect if you want to spend some time touring Barcelona by bike beforehand (watch this space for a write up on my Catalunya Experience of city cycling in Barcelona). 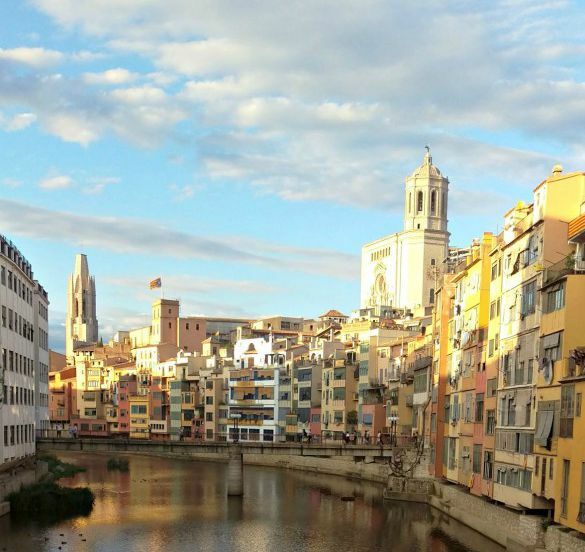 I don’t intend my love affair with Girona to be a quick fling, nor a simple holiday romance! I’m already arranging a return visit for later this year so I can pick up where I left off. I fully expect the city and cycling around Girona to become a life-long love. *Thank you to the Catalan Tourist Board for my #CatalunyaExperience and for igniting my love for Catalunya. 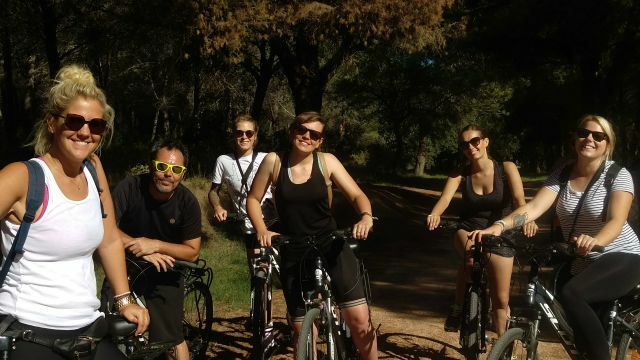 Share the post "Catalunya: City Sight-Seeing & Cycling Around Girona"
It really was wonderful. I can’t tell you how much I’m missing it. Can’t wait to head back with my husband and show him what he missed! Lots of the routes we did are perfect for family cycling too. I’ll write up a post specifically on that soon. There is so much beautiful scenery in Catalunya, I was really surprised by the varied landscape. I’ve come back with sooo many pictures!! The best trips are the ones where you get to do the things that you really love to do – it looks and sounds like you had a wonderful time! You’re so right, Michelle. There’s nothing better than doing exactly what you love whilst also experiencing a new country. I’ve brought back some wonderful memories. Wow Donna what an experience! I am absolutely sold and would love to try cycling abroad now. I assumed I needed to be an expert reading your posts on Facebook, but sounds like it is achievable for different abilities? Completely achievable for everybody, Penny. The Vies Verde is all disused railway line and is mainly flat. It’s perfect for all abilities, including children – a leisurely cycle is honestly the perfect way to start the day! I can’t recommend it highly enough! If you want some tips on which parts of Catalunya to cycle in, let me know (or keep an eye on here of course). Fritha Strickland recently posted…The MAD blog awards, a night away and the start of nesting..
Definitely a place to re-vist Fritha! So much to see and explore on foot or on two wheels. My husband is a Game of Thrones fan so I think he’d love it here! It’s wonderful that you can experience something you love so much in a beautiful place. Makes us feel lucky to be alive doesn’t it? Completely, Nadine. I’ve been back a week now and I’m still riding high! What a fabulous experience, Girona looks like an amazing place to cycle around. I’m sorry you didn’t get much sleep though. Anne recently posted…School – The next big step! It really is Gretta; I think you’d all really enjoy it. There is something for everyone and it’s so traffic free on the Green Ways. The Vies Verde particularly is perfect cycling ground for all the family. Enjoy your trip. I look forward to hearing about your adventures. What stunning views! My children and other half are keen cyclists, my son takes it very serious! I’m sure they’d love cycling The Vies Verde. I’m sure would too Joanne! Great food, beautiful architecture, lovely shopping, the coast….something to please everyone! I would love to go on a cycling holiday especially somewhere as beautiful as Girona. We flew to Girona when travelling to Bareclona and I had no idea it was so beautiful in itself……i need to go back now. OOOH so much gorgeousness!! We are planning to visit Barcelona next year and this has made me excited to get out and explore the region! Sonya Cisco recently posted…What the f*** do I do with myself now? Wow this looks amazing. For some reason I imagined Girona to be much more industrialised and not so pretty. Looks like somewhere lovely to explore! I wasn’t too sure what to expect to be honest, but it was lovely to discover this beautiful place with so much history and sophistication. I hope you get to visit and see it for yourself one day. Looks like you had a great experience. I do like the picture of the cathedral it draws me in to the build, beautiful.